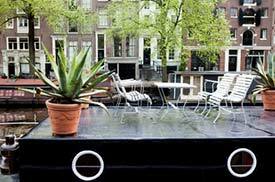 ABOVE: The deck of a houseboat in central Amsterdam. Europe's leading reservations service is based in Amsterdam. The last time we checked, it offered discount bookings for several dozen houseboats and nearly 400 apartments. Our holiday-rental booking partner lists more than 100 furnished vacation apartments, houseboats, and houses in Amsterdam and the surrounding area. These small apartments in the city center come with free high-speed ASDL Internet connections for your laptop. Each has a double bed and rollaway; minimum stay is three days. This site lists several dozen vacation apartments in Amsterdam. The owner also has B&B directories for Amsterdam, Rotterdam, and The Hague. Four houseboats were listed here the last time we checked, with descriptions and photos. This site describes a number of boats in the city center or on the Amstel River.